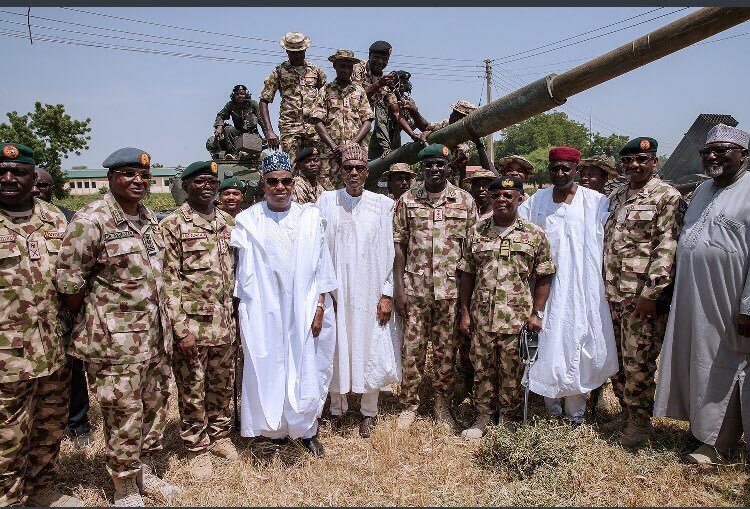 President Muhammadu Buhari earlier today visited troops of Operation Lafiya Dole in Borno state where he acknowledged the efforts of the military, security operatives, Governor of Borno State, Kashim Shettima and members of Civilian JTF for their collective efforts in the fight against Boko Haram. 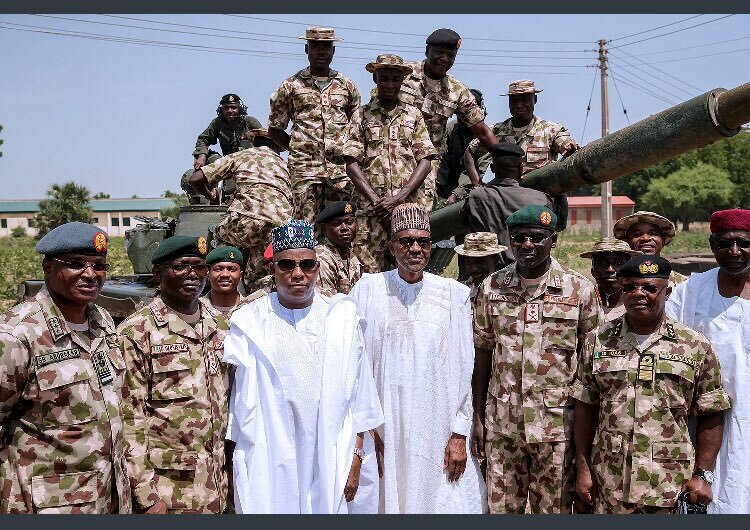 Buhari’s visit to Borno which is the first time since he became president in 2015 arrived the Parade Ground of Maimalari Cantonment 7 Div, Maiduguri at about 12:05 in the afternoon, addressed the troops which comprized of the Military, Police and other Para Military Personnel. In his address, Buhari said, the efforts put in place by security forces in sustaining peace, unity and progress of Nigeria as an indivisible country is highly commendable. The President therefore pledged Federal Government’s continuous support for troops of ‘Operation Lafiya Dole’ to end lingering crisis of insurgents and terrorism in the north east. “We are here today in Borno state to interact with you (troops) and to celebrate the 57th Indpedence Day Anniversary. “I want to commend you for your sacrifices in the fight against insurgents. I am here as a morale booster and i assured you that we will continue to do our best to support you in the frontline and end all forms of terrorism in our dear country. “I want to also said that those who thing they can do everything to divide Nigeria are jokers, because Nigeria is an indivisible country. “We as government will continue to improve on the economy to create jobs for the teaming youths. “We are also determined to Kick Corruption out of this country. “I was a State Governor sometimes ago and Borno was my base. At that time, nobody thought Borno will witness any crisis, but i want to reiterate that we will do our best to restore peace in any part of this great country”. Buhari stated. 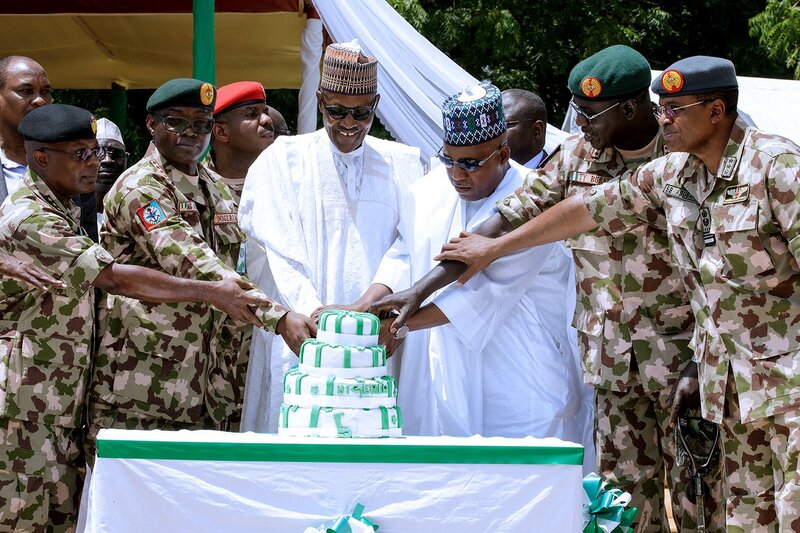 After addressing the troops, he also took time and cut the Anniversary Cake and interacted with wounded Soldiers in action including Sergeants Owen Eze who was shot in the neck in Gwoza Operational Base. 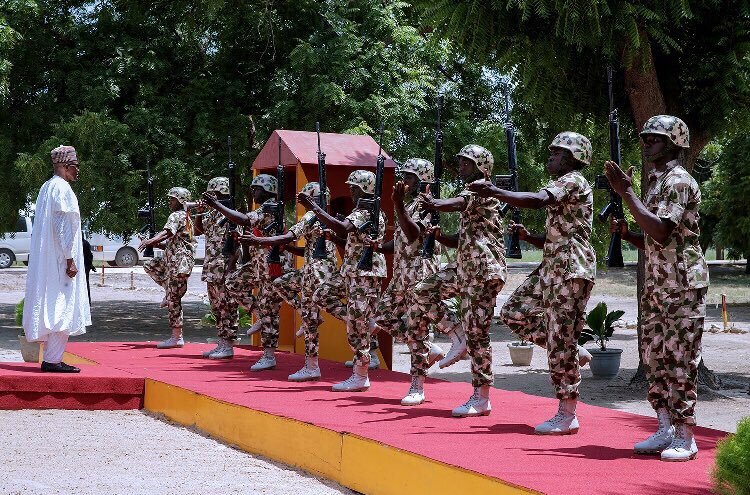 Earlier in his welcome address, Chief of Defence Staff, General Abayomi Olonisakin appreciated President Buhari for the visit and to celebrate the 57th Independence Anniversary with gallant troops who have all sacrificed their lives in the fight against Boko Haram Sect. “This visit by Mr. President is really a morale booster to us on the frontline. Recall that in the last two years, the people in the north east witnessed series of wanton killings and destruction of properties by insurgents, but we are glad for the relative peace peace being enjoyed now. And this could not have been achieve without the tremendous support we have been recieving from Mr. President”. Olonisakin said. 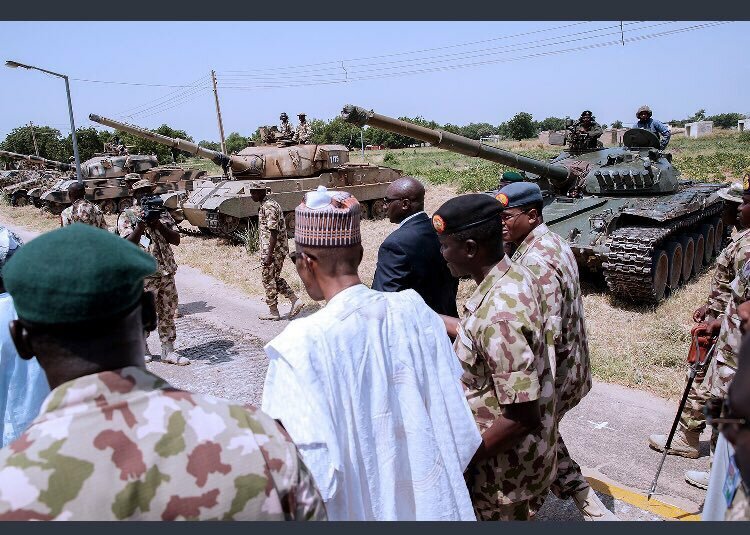 Among those who accompanied the President to Maiduguri are the Chief of Army Staff, Lt. General Tukur Buratai, Chief of the Naval Staff, Vice Admiral Ibok-Ette Ibas, and the Director General of the Department of State Services, Alhaji Mamman Daura among other service chiefs. The President had addressed Nigerians from the Presidential Villa before he departed the nation’s capital Abuja to visit the troops who he commended in the address “for rolling back the frontiers of Boko Haram’s terrorism, defeating them and reducing them to cowardly attacks on soft and vulnerable targets”. 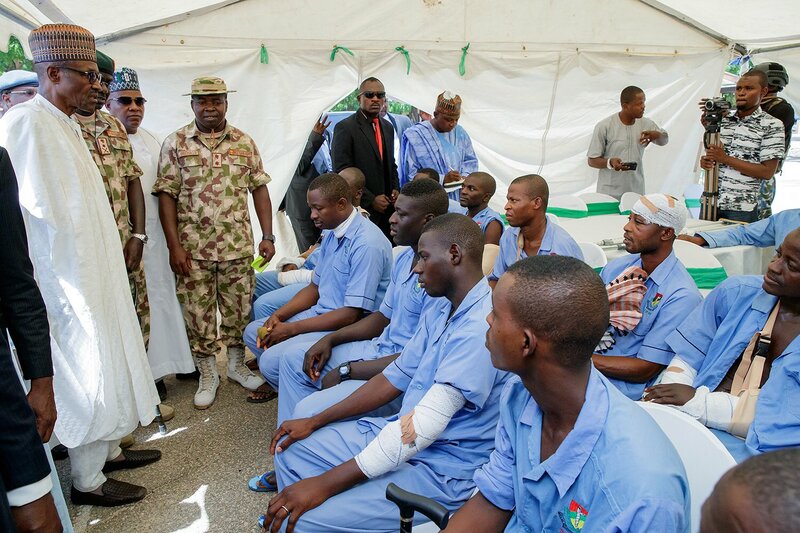 The President also visited our heroes wounded in the line of duty. Nigeria will eternally be grateful for their sacrifice.